Let’s talk about currencies. The different types of currencies and the various roles they play in the global financial system. Because this topic is complex and I don’t want to get lost in the weeds, I’ll be making broad sweeping generalizations while focusing on the key points that matter. My plan is to do this while trying not to bore you to death. Hopefully I’ll be able to tie all this together and show you why understanding these things will have a significant impact on your P&L in the year to come. Money (cash + credit) is the foundation of the global financial system. It’s the oil that flows through the economic machine, greasing the gears of commerce and allowing markets to turn. Money serves three primary functions: a store of value, a medium of exchange, and a unit of account. All currencies are now fiat. Meaning, they have no intrinsic value. They are not backed by anything tangible. Money is a system based on trust. This trust is complex and I’m not sure many people consciously think about it. It’s predicated not only on our opinions and expectations surrounding the currency issuers stewardship of its value, but the opinions and expectations of others as well. A fiat currency is ultimately worthless if it’s not fungible and others won’t accept it as: a unit of account, store of value, or medium of exchange. Since all currencies are fiat and not pegged to something fixed (there are pegged currencies but those are pegged to other floating currencies), their values, referred to as exchange rates, fluctuate relative to one another over time. Like all market prices, exchange rates are driven by supply and demand. Currency supply and demand can be separated into two broad categories: fundamental and speculative. Fundamentals are things like the trade and balance sheet of the currency issuer and its fiscal and monetary policies, such as its budget deficits and its control of the money supply. Speculative demand is centered around expectations of the relative and future value of the currency. Think exchange rate trends, interest rate differentials, and relative local market opportunities. Trade affects exchange rates through the balance of trade. Countries sell goods in their home currency. For other countries to buy those goods, they have to exchange their currency for the seller’s (exporter’s) currency. And vice-versa for when the country wants to import goods. This differential is referred to as the balance of trade. A trade surplus is an appreciating force on a currency and a deficit is a depreciating one. Speculative capital flows are the buying and selling of currencies with no attached underlying asset. Speculative capital moves in search of the highest total return. Total return is made up of: exchange rate differentials, interest rate differentials, and the local currency capital appreciation. Of the three, exchange rates are the most important because they tend to fluctuate more than interest rates or market returns. It does not take much of an exchange rate decline/increase to completely overshadow the return on interest rates or capital appreciation. Non-speculative capital transactions refer to all other cross border capital transactions. In the short-term (months to a few years) exchange rates are driven by speculative flows. In the long-term, economic fundamentals (trade + non-speculative capital transactions) dominate exchange rate movements. It’s the dynamic tension between these two that comprise the trends and fluctuations of currency markets. Expectations about exchange rates play the same role in currency markets as expectations about stock prices do in the stock market: they constitute the paramount consideration for those who are motivated by the total rate of return. To the extent that exchange rates are dominated by speculative capital transfers, they are purely reflexive: expectations relate to expectations and the prevailing bias can validate itself almost indefinitely… Reflexive processes tend to follow a certain pattern. In the early stages, the trend has to be self-reinforcing, otherwise the process aborts. As the trend extends, it becomes increasingly vulnerable because the fundamentals such as trade and interest payments move against the trend, in accordance with the precepts of classical analysis, and the trend becomes increasingly dependent on the prevailing bias. Eventually a turning point is reached and, in a full-fledged sequence, a self-reinforcing process starts operating in the opposite direction. The point is that currencies are inherently reflexive. Their tendency for large fluctuations make exchange rates the most important input in the total return equation. This means that as an exchange rate moves, it brings in speculators betting that it’ll continue to move. And the longer the trend endures, the more reinforced this behavior becomes. Until of course, the exchange rate diverges too far from fundamentals and the trend following bias weakens. Then the process aborts and and works in reverse. This is why some of the best trends (opportunities for profit) happen in the currency markets. It has a strong reflexive nature. And this brings us to my second point. The dollar. The US dollar is at 14-year highs after recently breaking out of its nearly 2-year consolidation. For the last three months it has gone vertical without taking much of a breather. This trend is the most important trend in global markets right now. Its effects will be wide-ranging. Those of you who’ve been with us for a while know we often refer to the US dollar as the lynchpin of global markets. It’s the main grease lubricating the global economic machine. This is true when the dollar is in equilibrium. It’s doubly true when it’s trending. And this is because in macro there’s something called the core-periphery paradigm, put forth by Javier Gonzalez, in his book How to Make Money with Global Macro. The reserve currency which is currently the US dollar. Hard currencies, that come from countries that can lend to themselves at competitive rates. These tend to be net-importers of commodities. Hard currencies generally act as safe-havens during periods of risk-off. And soft currencies. Soft currencies tend to be commodity producers. They are countries that have to borrow in other currencies at higher rates. These currencies depreciate during periods of risk aversion. Since the dollar is the reserve currency it’s the preferred medium of exchange for global trade. It’s also why commodities are priced in dollars. Global capital sloshes around the world in search of the highest total return. So when the dollar appreciates due to the sum of exchange rate differentials, interest rate differentials, and local currency capital appreciation, it attracts more capital (both speculative and to a lesser extent non-speculative). This creates the feedback loop. But that money is coming from somewhere… that somewhere is the periphery. A higher trending dollar is a depreciating force on commodities and commodity producers (soft currency countries). And a weaker dollar is an appreciating force on commodities and its producing countries. By that same logic, commodities fall due to capital flight back into the reserve currency (USD). And also from producers decreasing their prices to compensate for the appreciating unit of account. They then increase production as well to make up for the now lower income due to unfavorable exchange rate differentials. There’s also other reasons — such as emerging market debt becoming more expensive when the dollar rises and the Fed’s interest rate policy affecting rates throughout the world in addition to the amount of liquidity sloshing around. Simply put, much of the world lives at the mercy of the dollar and the Fed. On average, the cycles are longer at the core than at the periphery. 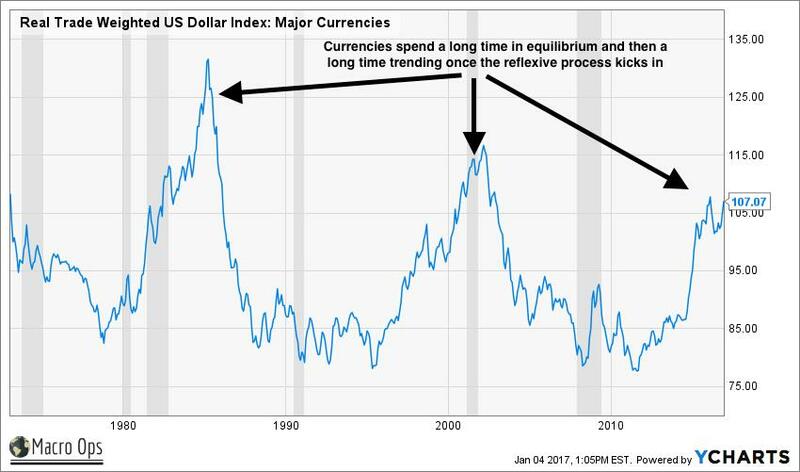 Cycles are longer at the core when the reserve currency is appreciating than when it is depreciating. This is perfectly logical. A depreciating dollar equates to higher commodity prices. Higher commodity prices feed into greater inflationary pressures. And higher inflation results in the Fed raising rates; increasing the total return profile of US markets and holding US dollars. So a stronger dollar not only attracts speculative capital flows but it also subdues inflation, which keeps real rates high and stays the Fed from tightening too much. Hence why core cycles last longer when the dollar is going up. Hopefully you’ve stayed with me and haven’t jumped to twitter out of boredom because now I’m going to tell you why this is important. The last few weeks I have been banging my head against the wall trying to understand the dollar dynamic at work. I think if I can understand this then I’ll be able to make a lot of money in the coming year. Here’s why it has been hard. The recent rally in the dollar is confounding a lot of currency models. These models say that at the current interest and exchange rate differentials, the dollar should not be moving higher against many of the major pairs (can be otherwise stated as the dollar is either fair or overvalued). A number of currency analysts that I have a lot of respect for have been saying that the recent move just “doesn’t make sense”. When I first heard that my ears perked up. I’ve found in markets that when you hear people saying a move doesn’t make sense, it generally means that the move is going to keep going. Like Bruce Kovner would say, “I like to know that there are a lot of people who are going to be wrong.” The “doesn’t make sense” usually equates to “a lot of people who are going to be wrong”. On a short-term technical basis the dollar is overextended and I’ve been expecting a pullback. I think we’ll see one in the next few weeks. And it could very well be a sizable one, lasting a couple of months. But my conviction on the longer-term dollar bullish thesis is growing. Though with the many unknowns surrounding the new incoming administration, there are a number of things that could flip my viewpoint. We are approaching a giant macro crossroads and the Administration’s and Fed’s response over the next few months will determine where we head and whether the core (US) benefits or the periphery (EM) prospers. Or as Soros would put it (and I paraphrase), “it will decide whether we have a vicious circle or a benign one”. A benign circle for the United States is when the dollar appreciates and the bull market at the core (US) is extended. A benign circle for the US is a vicious one for emerging markets and vice-versa. Vicious or benign, if we’re able to get our dope right, we should be able to capitalize on a lot of opportunity. Let’s run through each scenario so we’ll know what to look for as things unfold. Let’s go back to our total return equation of: exchange rate differentials, interest rate differentials, and local currency capital market appreciation to see how the dollar stacks up. The chart below is of the real trade weighted US dollar. See how it tends to move from long periods of equilibrium and stasis to long periods of aggressive trends. That’s due to the reflexive process kicking in. These trends drive exchange rate expectations which drives the trend. It’s a safe bet to assume that the exchange rate differential is a strong positive in the dollar total return equation. And it’s becoming stronger. Also notice that the symmetry in time between the last two dollar bull trends. 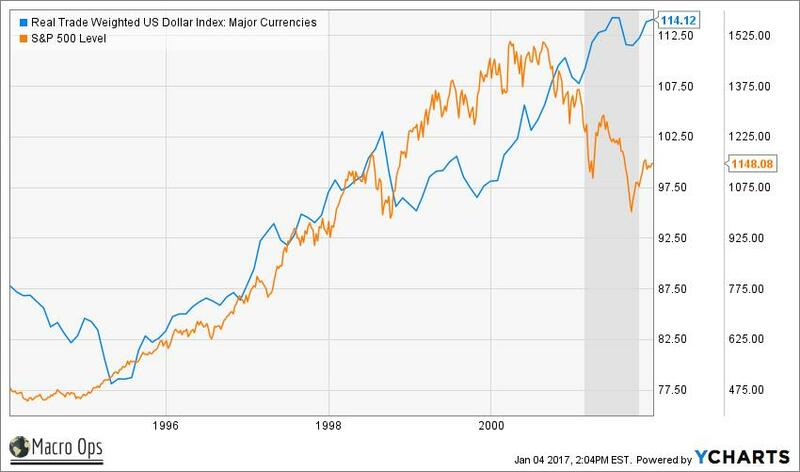 The dollar bull market in the 80’s started in 78’ and ended in 85’ (approx. 6.5 years). In the 90’s it started in 95’ and ended in 02’ (approx. 6.5 years). The current dollar bull market started in mid-11’. If this bull market follows a similar temporal symmetry, the dollar should continue to rise until the end of this year. The above chart (via Factset) shows the interest rate differentials. The spread between US rates and its developed market peers is now at record high levels. So we can say that interest rate differentials are a strong positive for the US dollar. Lastly, we have local currency capital appreciation. Which means we need to check how the US market is doing relative to the rest-of-the-world (ROW). This chart shows the performance of the S&P index over the EFA which is an ETF that tracks over 900 developed market mid-to-large cap companies excluding North America. When the chart is trending down it means the ROW is outperforming the US and vice-versa for when it’s moving up. As the chart shows, the US has been outperforming its developed market peers for over 8 years. Local currency capital appreciation is again a strong plus in the dollar total return equation. Where e= exchange rate, i = interest rate differential, m = capital appreciation, s = Speculative capital flows. Up arrow means increasing (for those of you with an eye for detail I flipped the arrow on s, Soros used a down arrow to signify increasing speculative inflows which I think is confusing), and the side arrow is essentially an equal sign. All the equation is saying — in an unnecessarily nerdy way — is that the dollars current total return picture is conducive to increasing speculative inflows which will lead to further trend strengthening (ie, reflexivity). And then here is my additional logic chain we can add to this total return picture which will drive expectations for all of the above barring no intervention by the incoming administration. The prospect of coming fiscal stimulus + the extended length of this bull market + the long period of time the Fed has stayed low on rates + historically high valuations and increasing speculation = greater propensity for Fed to raise rates at a faster rate than market is expecting = stronger total return for investors = more speculative inflows = higher USD exchange rate and USD asset/market prices = greater chance Fed becomes more concerned with asset bubbles than its inflation target which will stay low from a stronger dollar = reflexive loop = goldilocks economy/market for the core over the short-term = unsustainable benign circle in the long-term. We can also apply this to the rest of the developed world. Stronger dollar = low to lower commodity prices = lower inflation + low valuation + sluggish economic growth = lower rates for longer in ROW = widening US interest rate differential = stronger dollar = benign circle. Do you follow? Are you picking up what I’m putting down? Kudos, if so. If not, no worries just take what you get and read on. I’ll sum up the important stuff at the end. The longer a benign circle lasts, the more attractive it is to hold financial assets in the appreciating currency and the more important the exchange rate becomes in calculating total return. Those who are inclined to fight the trend are progressively eliminated and in the end only trend followers survive as active participants. As speculation gains in importance, other factors lose their influence. There is nothing to guide speculators but the market itself, and the market is dominated by trend followers. The logic chain as things stand now, bring us to a stronger dollar, a core bull cycle and a benign circle. This is the 98’-99’ analog that we’ve talked about in past reports where the US market runs higher. In combination with a stronger dollar and stagnating commodities and emerging markets. It would put us around the early 99’ time frame. Soros said this about the benign circle that occurred in the early 80’s. Reagan’s benign circle was sustained by a differential in interest rates rather than inflation rates and there was an ever-growing trade deficit which was matched by an ever-growing inflow of capital. While in the first case it was possible to claim some kind of equilibrium, in the second case the disequilibrium was palpable. The inflow of capital depended on a strong dollar and a strong dollar depended on an ever-rising inflow of capital which carried with it ever-rising interest and repayment obligations. It was obvious that the benign circle could not be sustained indefinitely. Like Reagan’s benign circle and Clinton’s that followed, this market looks like it has tripped a strong reflexive function. A classic boom/bust sequence on multiple levels. One that could be extremely profitable in the short-term but dangerous in the long-term. If this is the path we take then we want to remain concentrated in developed markets, particularly the US. We should look for stocks that will benefit from higher rates and not necessarily higher commodity prices. We want areas that fit around the Trump reflation/stimulus narrative and that are domestic focused; not vulnerable to higher exchange rates. And of course we want to be long the dollar. The new administration rode a wave of populism into the white house. Trump’s platform is centered around American interest first and doing whatever it takes to bring back jobs, especially in the rust belt. Many of those jobs are manufacturing jobs. US manufacturers don’t benefit from a rising dollar. Accusing China of artificially keeping the yuan weak in order to gain export share was a constant focus of the Trump campaign. So it’s not difficult to imagine a scenario where the dollar rises enough to cause the Trump administration to intervene and reverse it. Similar to what Reagan’s Secretary of Treasury Jim Baker did in 85’, with the Plaza Accord. As President, Trump has the power to nominate members to the Fed’s Board of Governors; including the chair and vice-chair. We should see these nominees shortly after he takes office. These picks and the amount of influence he chooses to exert over the Fed could have wide-ranging impacts on the dollar and equity market outcomes. If any significant interventionism does occur, it will start up a short and vicious circle. Money will flow from the core to the periphery. Inflation will rise and commodities will run. And there will be some great trades to be made. 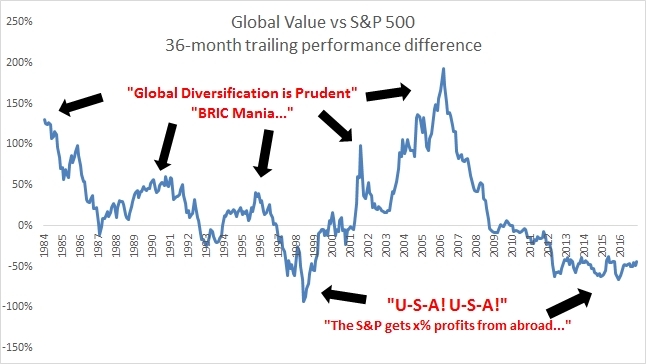 The following chart (via Meb Faber) shows global value against the S&P 500 36-month trailing performance. Like the chart I showed earlier, the US has been dominating the global investment landscape. 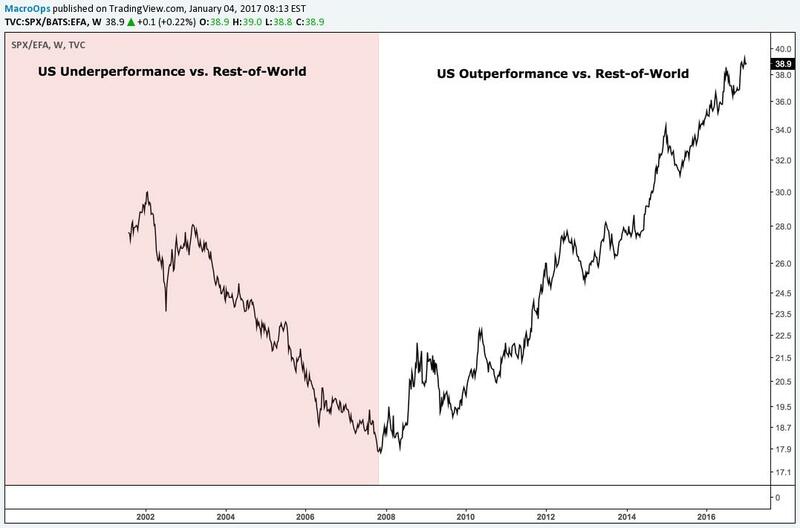 But one regime sets the stage for the next, and now we find ourselves in an environment where US has outperformed everything since the 2009 bottom, but out performance alters values, and now the US is one of the most expensive stock markets in the world at a CAPE ratio around 27 (though nowhere near the peak valuation of 45 in 1999). Foreign value has lagged badly, including three consecutive years of underperformance to the S&P in 2013-2015. This has pushed the CAPE ratio of the cheapest basket to a value of around 9 or 10, less than half the valuation of US stocks. (Actually it is almost a third the value of the US!) A global value approach is having a great year in 2016, and we look for that to continue for the foreseeable future. So, maybe instead of chanting U-S-A, investors should be thinking C-A-P-E? US valuations have only been higher two other times in history; 1929 and 2000. It’s safe to say the rubber band is stretched and we’ll soon enough see things revert back the other way. This also means that if the dollar were to reverse, there are some amazing value opportunities outside of the US. 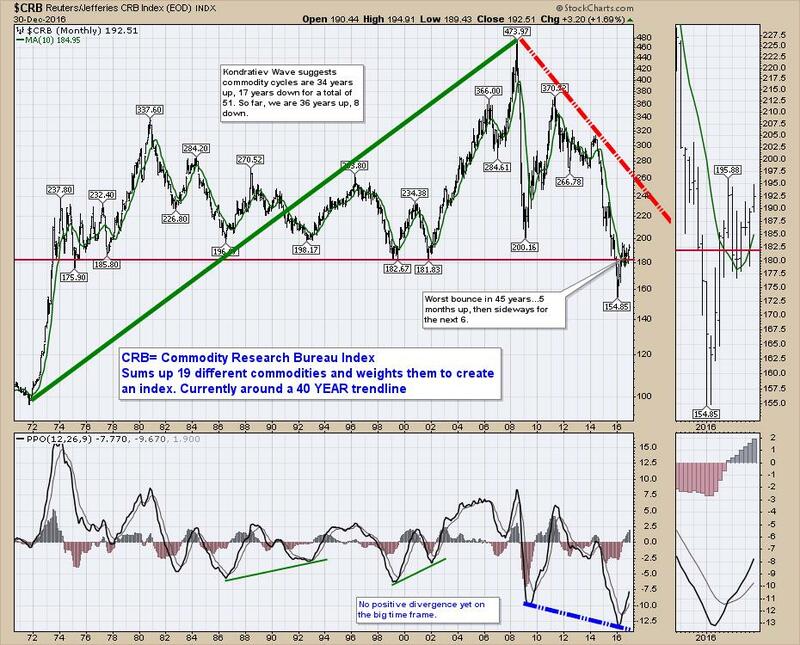 Look at this chart below (via Greg Schnell) showing the CRB (Reuters/Jefferies Commodities Index) over the last 40 years. The index is hanging around its 40-year low. Remember, commodities are a dollar story. But this chart shows how much potential mean-reversion could occur in commodities if the dollar were to reverse. We’re talking a significant multi-year trend and a huge profit opportunity. If the dollar turns, we’ll buy up emerging markets and commodity linked assets hand over fist. Right now we are cruising along the benign circle road (stronger dollar) and our speed will only pick up barring any intervention. Since that’s the road we’re on, that’s the road we need to game. The way I see it right now (and this is liable to change) is that we’ll see the benign circle play out completely and the Trump administration won’t do anything until the trend has already exerted itself. This is for a few reasons. 1) The stock market is going to be moving higher. Sentiment is going to be positive. And his administration has a big To-Do list. There’ll be little incentive for him to rock the boat. He may even see the stronger dollar as a global vote of confidence in his leadership. 2) We’re seeing improving economic numbers from around the world. The optics on this improvement are being multiplied by the base effects we talked about in last month’s report. 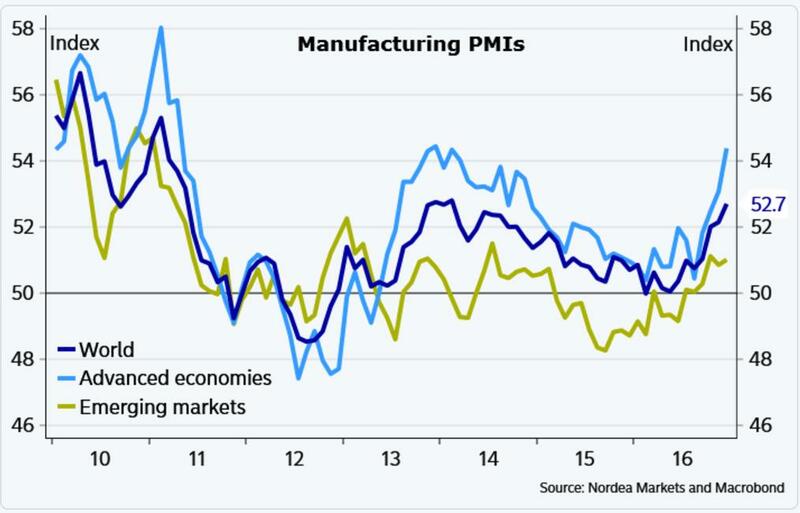 The chart below shows manufacturing PMI numbers improving across the board. 3) If this dollar bull market follows a similar temporal symmetry to the last two, it should last roughly to the end of 2017. Trump and the Republicans will be working on tax reform, cutting regulation, and planning infrastructure spending during that time. As long as the party keeps going the dollar will be out of sight out of mind for the administration. If I’m right, the US market will likely go on a tear higher from here (again, reflexivity). This will be accompanied by increased volatility in both directions. European and Japanese stocks should also perform well, especially exporters who benefit from a weaker euro. Many of these are trading at depressed levels and will likely do well over the coming months. Commodities likely won’t go down right away from a stronger dollar. This is because the deflationary pressures of a stronger dollar are being counteracted by a bump in improving global fundamentals (ie, the above PMI chart). They may even trade slightly higher from here but there’s a ceiling on how much further they can recover as long as the dollar remains strong. There will be a lot of opportunity in markets over the coming year regardless of which way things turn. And needless to say, we’ll be keeping a close eye on the dollar. Side note: In 2013 and 2014 I made the vast majority of my profits trading currencies. Those also happen to be my best return years. The last two years trading in currencies have been a losing proposition with no trend to play. That’s how these things typically move. From stasis to trend. We’ve had nearly two years of consolidation in the dollar. That’s a good deal of fuel for the next leg up. A move that I think we’ll be able to make a killing on if we execute correctly. I expect the dollar to retrace over the next few weeks to months due to technical short-term overextension. Once that retrace plays out, we’ll have a great opportunity to start building some positions. . Above was an excerpt from our monthly Macro Intelligence Report (MIR). To learn more about the MIR, click here.